Rebecca Cowen-Hirsch, senior vice president of government strategy and policy at Inmarsat Government, has said many government customers still have false perceptions about the use of satellite communications as a commercially managed service. In a Space News opinion piece published Tuesday, Cowen-Hirsch wrote the satcom industry needs to debunk the myths that affect how the government uses commercial communications amid a growing demand for high-bandwidth connectivity. 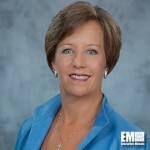 She noted some federal customers believe that commercial satellite services are not secure and interoperable, not compatible with military systems and that the government benefits from independency in building its own satellite and ground networks. Cowen-Hirsch explained that such perceptions are different from what vendors can actually offer. Satcom services can facilitate technology refresh and modernization as well as integration into baseline defense architectures, according to the executive. She added that a “one size fits all” acquisition model that the government follows limits how users leverage available products and services in the industry. “Users need to have access to nothing less than a ‘fully stocked toolkit’ – with a finite amount of legacy, purpose-built platforms for specific unique needs, as well as modern, commercially-provided options to readily obtain mission-critical mobile and highly available capabilities,” she noted.